Transparency Market Research (TMR) has published a new report titled, “Soft Tissue Repair Market - Global Industry Analysis, Size, Share, Growth, Trends, and Forecast, 2018–2026”. 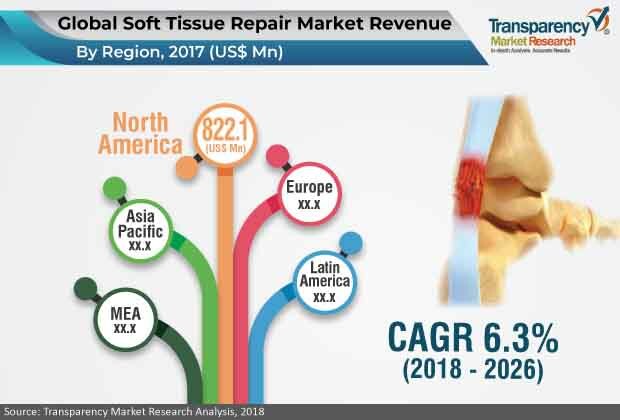 According to the report, the global soft tissue repair market is anticipated expand at a CAGR of 6.3% from 2018 to 2026. High prevalence of sports and orthopedic injuries and increase prevalence of breast reconstruction and hernia repair are projected to augment the global market between 2018 and 2026. Increase in number of prevalence of breast reconstruction is driving the soft tissue repair market. The market Asia Pacific is expected to expand at a significant pace during the forecast period owing to the increase number of surgical procedures, such as hernia repair, rise in number of product offerings in China and Australia, and rapid development of the medical device industry. Increase in participation in sports and physical fitness activities are propelling the market for soft tissue repair. Rise in prevalence of sports injuries, increase in number of orthopedic procedures, and increase in geriatric population in emerging economics, such as China, India, and Australia, are anticipated to fuel the market in Asia Pacific. Available alternatives for soft tissue repair restrains the soft tissue repair market. Alternative therapies, such as physiotherapy, orthopedic manual therapy, PRICE, i.e., protection, rest, ice, compression, and elevation, are hampering the market for soft tissue repair. Apart from this, painkiller such as non-steroidal anti-inflammatory drugs used to ease pain and reduce any swelling of acute soft tissue injuries. Additionally, corticosteroids injections can also be recommended for persistent inflammation, which ultimately restrains the market for soft tissue repair. Technological advancements are projected to increase during the forecast period. ARTELON DYNAMIC MATRIX, a product of Artelon, has advantage over the suture and tissue graft. It maintains the natural stiffness and enhances the strength. Additionally, it provides a broad elastic profile, which promotes reproducible surgical tensioning. CelGro, a product of Orthocell, is a highly effective scaffold medical device. CelGro has the capability to enhance tissue growth and repair injuries. The report also provides profiles of leading players operating in the global soft tissue repair market. These include American Medical Systems Inc (Boston Scientific), Arthrex, Inc., C.R. Bard, Inc., Covidien plc (Medtornic), Depuy Synthesis (Johnson & Johnson), Integra LifeScience Corporation, LifeCell Corporation (Allergan), Smith & Nephew, Stryker, and Wright Medical Group N.V. New product launches and focus on developing technologically advanced product and patent approval are expected to drive the global market during the forecast period. In November 2017, Orthocell Limited received approval from European regulatory for its CelGro collagen medical devices that are utilized for dental bone and soft tissue regeneration procedures. In January 2016, AlloSource, provider of cartilage, cellular, bone, skin and soft-tissue allografts for use in surgical procedures and wound care, received U.S. patent for its new cartilage repair allograft, ProChondrix Cartilage Restoration Matrix.